It was solid win before a tough trip to Paris next week. Real Madrid hosted and defeated Getafe by 3-1, with a double from Cristiano Ronaldo and one goal from Gareth Bale. The Merengues played almost 45 minutes against a 10-men side. 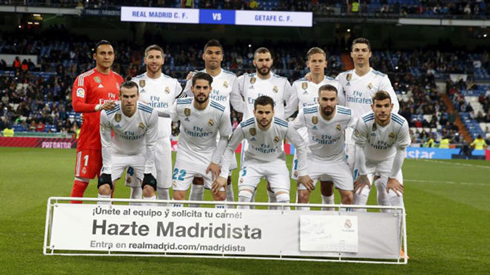 With barely nothing at stake in La Liga anymore, Zinedine Zidane strangely decided not to rotate his key players tonight against Getafe and it was without surprise that Real Madrid beat their opponents 3-1 to cement the 3rd place in La Liga. After seeing Gareth Bale breaking the deadlock, Ronaldo went on to score a double and secure the 3 points for the men in white. The second half was played against a 10-men side after Remy's red card around the 47th minute and if you were one of the lucky ones who used your promotional code at half-time, you probably made the best out of it. Next Tuesday the Merengues travel to France to face PSG in the Champions League round-of-16 second leg. With Kroos and Modric still recovering from minor injuries, Zidane played Llorente and Isco alongside with Casemiro in midfield. In defense, Theo occupied Marcelo's place on the left, Carvajal on the right and Sergio Ramos partnered up Nacho in the center. In attack, the Frenchman showed no contemplations and played Bale, Benzema and Cristiano Ronaldo. It was a clear sign that Zidane was going after the 3 points tonight, hoping that this win would boost the motivation levels for next Tuesday's game against PSG. On the other hand, some of his key players may end being more fatigued than usual and that could turn out to be costly. Real Madrid scored first tonight, as Gareth Bale found the back of the net from a bouncing ball inside the box around the 24th minute of the first half. 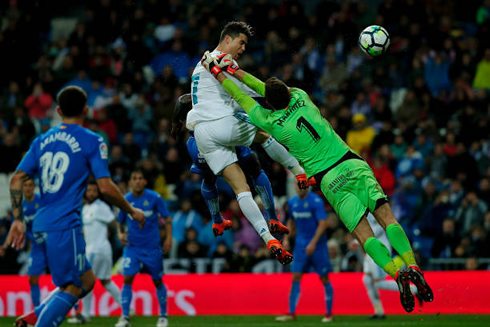 The Welshman converted his chance easily, as he picked the far post and kept his show low to make it harder for Getafe's goalkeeper. It was Bale's 8th goal in the league this season and he's now Madrid's 2nd top scorer. The 2-0 arrived by Cristiano Ronaldo's left foot, just a few instants before the half-time break. The Portuguese star picked up a Karim Benzema pass as he was entereing Getafe's box, turned around, cutted inside to find some space and then struck with his left foot straight into the back of the net. 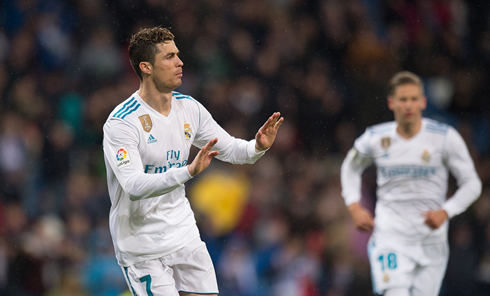 A great move from the 5-time Ballon d'Or winner, who seems to be improving his form week after week now that we're entering the last months of the season. Getafe was forced to play with 10 men since the 2nd minute of the second half, after an unncessary foul from Remy on Nacho, which happened near the sideline. 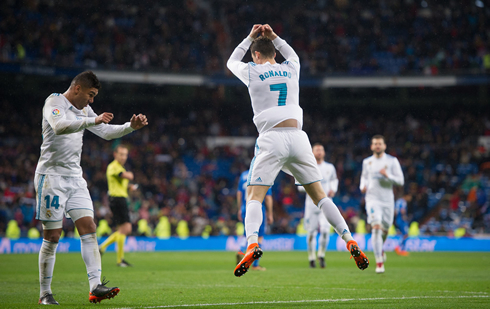 Nevertheless, it would be Getafe scoring the next goal in the game, with Portillo converting a penalty-kick and sparking some hope in still leaving the Bernabéu with a positive result. Their hopes wouldn't last long though, as Cristiano Ronaldo jumped to the 3rd floor to head a Marcelo cross and make it 3-1 to Real Madrid. The 33-year old jumped a lot more than everyone else around him and showed the critics what he's capable of. Game over! Can he do it again against PSG next Tuesday? Attackers: Bale, Benzema, Cristiano Ronaldo. Cristiano Ronaldo next game for Real Madrid is on March 6 of 2018 against Paris-Saint Germain. You can watch Juventus live stream, PSG vs Real Madrid at the Parc des Princes, Barcelona vs Atletico Madrid, Manchester City vs Chelsea, Brighton vs Arsenal, and Freiburg vs Bayern Munchen, all matches provided from our soccer live game pages.